Perth, Western Australia. Crime scene, Hoarding Cleaning, Rubbish removal, Trauma cleaning. Established in 1999. 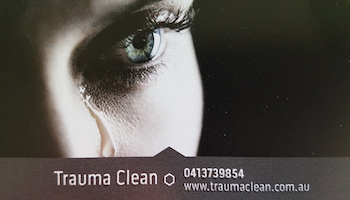 1With over 14 years experience in the Trauma Cleaning business, TRAUMA CLEAN has provided the Western Australian people with a professional and discreet service in all situations.